Our podcast review series takes a look at one of the most popular pro wrestling podcasts on the internet. Welcome to Should I Listen To This? where we dive deep into a podcast to find out what it’s about, what works, what doesn’t, and whether or not you need to make the all-important decision to hit subscribe and add it to your rotation. Know a podcast you’d like us to consider? Send us a tweet @awfulannouncing and we’ll add it to the audio pile. What Is It? 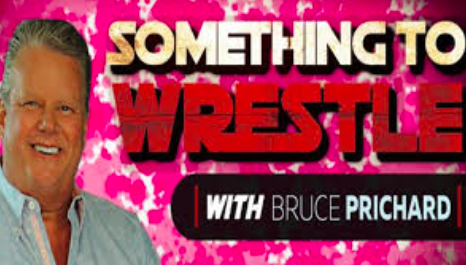 : It’s the podcast of former WWE writer, executive, and on-air talent Bruce Prichard. You might know Prichard best as “Brother Love,” the heelish televangelist with the uber-red face who hosted his own talk show in the late 80’s and early 90’s in the WWF. However, Prichard’s experience goes behind the curtain as well as he recounts his two decades of working alongside Vince McMahon as his right-hand man in the WWF and his time in TNA Wrestling. Each podcast can run in the 2-3 hour range (the Vince Russo episode clocks in at over 3:30!) and features a singular topic that Prichard and host Conrad Thompson discuss. Although each show only focuses on one event, wrestler, or subject, the shows are filled with entertaining personal stories from Prichard, impressions of some of wrestling’s biggest characters, and unique “what ifs” that only someone with intimate backstage knowledge would have. Most weeks, the show’s topic is actually decided by its listeners through a Twitter poll, which is a very fan-friendly concept. This Friday we discuss the Rise of CM PUNK! Who’s The Host? : Conrad Thompson hosts the podcast and leads Prichard through the given topic of the week. While most of the show is Prichard telling stories, recounting booking decisions, and doing one of his myriad of impressions, Thompson’s role is vital to the success and flow of the podcast. Thompson cites historical data including the work of longtime writers like Dave Meltzer, which gives Prichard an antagonist to work off of given there’s no love lost between the two. His research into the weekly topic allows the show to reach depths and insights that few other podcasts can match. For instance, the Hulk Hogan 1988 episode is more of an oral history of the WWF in 1988 than focusing on just the Hulkster. A mention of Kamala might lead to an incredible or funny story about the “Ugandan Giant.” The Roddy Piper episode featured a jaw-dropping story about Vince McMahon possibly bringing in O.J. Simpson for WrestleMania that is truly extraordinary. The WrestleMania VII episode recounts why WWF went away from having Hogan battle “Sheik Tugboat.” During The Million Dollar Man episode, Prichard tells how Vince McMahon paid a fellow airline passenger over $500 just to put a cigarette out. It’s those tangents and stories that make the podcast so entertaining to listen to. It’s not just all entertainment and laughs, though. Thompson isn’t afraid to go toe-to-toe with Prichard when the conversation turns to controversial or more serious topics like wrestlers’ battles with substance abuse. And Prichard doesn’t hold back in answering any question and addressing “rumor and innuendo” about anything and everything from the wrestling industry. What’s a Normal Episode Like? : After a brief introduction and some general chit chat, Thompson and Prichard jump straight into the topic of the week. You might ask going in, “how can two guys spend three hours talking about a single wrestler or random PPV from the 1990s?” But after listening you’re somehow always left wanting for more. Even the ads are entertaining as Prichard may do a read in the middle of the podcast while doing his Dusty Rhodes or Randy Savage impersonation. It’s difficult to get through an entire podcast given the length in one sitting, but it’s definitely worth sticking it out to hear the whole episode. It might be obvious from the above description, but it’s worth noting that this is Prichard’s perspective on history and others from the pro wrestling world may combat Prichard’s recollection or offer criticism and different takes on what happened years ago. Who Is It For? : The pro wrestling podcast industry has exploded in recent years. Everyone from Prichard to Jim Ross to Steve Austin to Ric Flair has a podcast it seems. Something to Wrestle is unique in that it’s not an interview with different guests every week, nor does it discuss current events. Rather, it’s best described as the definitive historical podcast of record for the wrestling podcast universe. Prichard isn’t going to give his opinion on the Roman Reigns-Braun Strowman feud. In fact, he will not cover any event or time period or wrestler where he wasn’t personally present or a part of the company. While that might be disappointing if you want to hear about WCW or the 1992 Royal Rumble, Prichard’s 20 years in the WWF means there are still plenty of topics to cover. If you were a wrestling fan at any time from 1987-2008, there is something here for you. Who Is It Not For? : If you’re not a professional wrestling fan, this podcast probably isn’t for you. Even if you’re not though, some of the stories and characters are so funny and entertaining that you’d be laughing anyways. Can I Jump Right In? : Absolutely. Given that each podcast is on one historical topic, you can pick and choose where and when and what episode you want to listen to at any time. I binge listened to about a dozen episodes while driving recently and they were all a blast. Be careful though, when Prichard launches into a hysterical impression of Vince McMahon or Jim Cornette you may drive off the road from laughing so much. Some of the best episodes include any of the bio-podcasts on stars of the 80’s like Ted DiBiase, the WrestleMania recaps, and episodes on Vince Russo and Jim Cornette that detail more of the creative side of the business. For something more historically recent, the TNA podcasts are astounding to listen to because of the craziness of that company and going behind the scenes of the XFL contains some fascinating stories of how a wrestling organization tried to start a football league. What’s Not Great? : The podcast can definitely be NSFW at times and feature mature content so be forewarned about that aspect. The pro wrestling world isn’t exactly the most prim and proper industry and all of its highs and lows are revealed. Really though, from a structural standpoint this is such an entertaining listen that it’s hard to think about what Prichard or Thompson could improve upon as they’ve clearly found a format that works. So, Should I Listen To This? : HUH? I mean, yes, of course you should listen to this. Bottom Line – TL;DR: Something to Wrestle has taken the podcasting world by storm. If you are even the most casual pro wrestling fan, then you need to subscribe today.